Today, there are about two million accountants and bookkeeping specialists in the United States. According to the U.S. Bureau of Labor Statistics, starting from 2016, there are more than 1,700,000 clerks who are involved in bookkeeping, accounting, and auditing. Also, the number of workers in this sphere is constantly growing. The Bureau of Labor Statistics (BLS) predicts that employment in the accounting field will grow 10 percent from 2016 to 2026. While the accounting industry is becoming more competitive, the customers and employers are becoming more demanding. The data from Sage says that 83% of accountants think that clients expect more from them than they did five years ago. All these things lead to the fact that many accountants work under tremendous stress and feel like squirrels in a cage. In this article, I will tell how accountants may reduce the psychological burden during their work. A few years ago, when the workload hadn’t yet reached its current level, researchers have already noted the monstrous level of stress faced by workers in the accounting industry. Moreover, despite the fact that the accountants’ work is constantly accompanied by stress, there are several year periods when the workload becomes even greater. For instance, the nearest notable deadline is the 15th of April for most accountants. For them, the heavy lifting begins after New Year’s Day right up to April 15. During this busy season, long days and weekend work become the norm as accountants work to get their firms’ or clients’ finances in order. 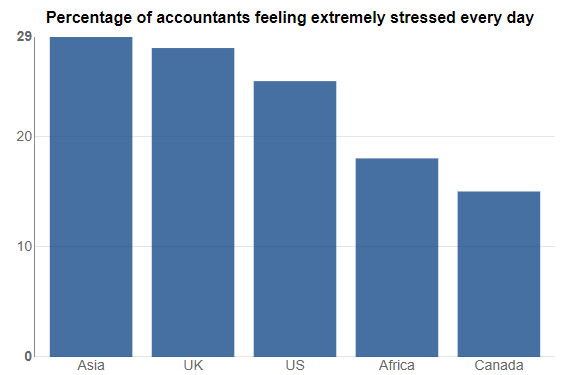 Now, let’s discuss how accountants can avoid unnecessary stress, considering that there is already too much of it. You can make busy periods easier in advance. Make sure that your boss remembers about the earliest possible submission dates of all tax documentation that might be needed. Ask your boss to make a mark in his or her calendar for a time when you must be provided with all the necessary documents. At least, you will reduce the chances that you will have to chase deadlines to complete your work. Looking at the numbers of hours worked, labor costs, and overall operational spendings, some businesses may be ready to support its employees, namely, to hire seasonal workers and make the workload more balanced. Today, there are a lot of different specialists – administrative assistants, tax advisors, and tax preparers who have enough knowledge and skills to support diverse accounting activities. You may tell the boss that load sharing will help you do your job in a timely and more effective manner. You may be able to reduce stress by a smarter approach to the choice of accounting solutions. Ideally, software should handle a great part of the routine work. If for some reason, you still have to get the data manually, or you just find your current solution useless, try to discuss the possibility of replacing it with the boss. Also, it is better to use fewer tools. You should use only those solutions that allow you to do all the necessary work and no more than that. Thus, you won’t have to remind which tool contains some of your important data when you instantly need it. As an option, you may find a solution that integrates with the rest of the tools you use. Then you can easily transfer data from one program to another without getting tangled up in the software. If for some reason you are not using any software in your work, think about start doing it. Today there is a huge selection of financial solutions. If you want to know which accounting software works best for you, choose one and test it via a free trial. If none of the solutions fit your needs, perhaps your firm should consider the development of its own tool. Some IT companies offer such services as financial software development, which allows businesses to implement solutions tailored to the needs of their organizations. Explain to your boss that development and implementation of an accounting tool will pay off. Eventually, it will allow him or her to reduce staff costs and make you more productive.